If you want to show the people around you that we can go from war to peace then this t-shirt could help. The shirt is available in style for men and women and it comes in many colors an in sizes Small – 6XL. 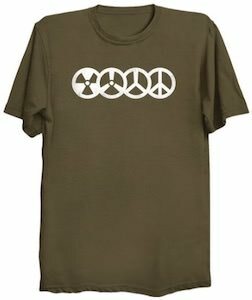 On the shirt you can see a row of round symbols with on the left an radioactive symbol and on the right the peace symbol and the two in the middle show who they can change into each other and that can make this world a little bit better if we just think about that we can get peaceful.